World Science Festival / Asia-Pacific Architecture Forum / State Library of Queensland, Brisbane, QLD, Australia, 1 March - 15 May 2016. 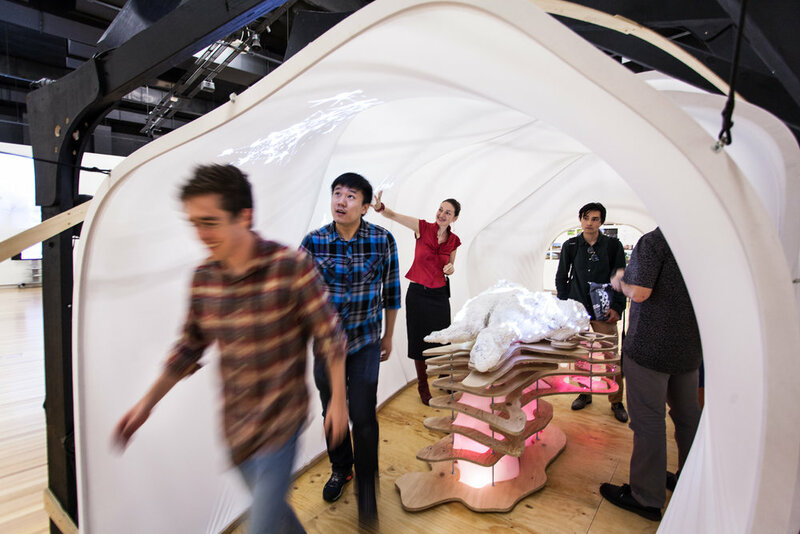 Sulcus Loci is an immersive interactive installation designed and built by students from Interaction Design and Master of Architecture courses at The University of Queensland in collaboration with artist Svenja Kratz. Sound Artist Eve Klein from UQ’s School of Music has composed a complementary soundscape for the work. Sulcus Loci showcases the impressive image library generated by researchers of Queensland Brain Institute’s Microscopy Unit. The team has created a structure and experience that highlights the interconnection between neuroplasticity and human environment. This cross-disciplinary project was initiated by UQ Art Museum as a part of broader program to engage students and academics in a creative nexus of the arts, science and environment. Imaging from the Queensland Brain Institute (QBI) shows us what micro-level brain function looks like in real time. Due to their scale, these images look abstract and otherworldly—we are given an insight which moves deep inside the minute structures and operations of our brains. Imposing sound upon these images is another abstraction. To compose the music for this installation, I began with a simple question: what does a brain sound like when viewed at the level of neurons firing and connecting? Sulcus Loci’s soundscape was created through a process of sonification and composition. Sonification is a process where data is translated into the medium of sound. QBI Images were mapped to audible frequencies and turned into synthesiser instruments for musical playback. Additional processing and editing helped the timbre of these sounds fit with the visual and tactile aesthetics of the installation. Sulcus Loci triggers different layers of sound and images based upon how people interact with the space while moving through it. It’s design mimics the connections our brains make continuously, connections which form the basis for our human experience. University of Queensland – Sulcus Loci interview. Photography on this page: Judit Losh.